Learn about the New Orleans regulations on motor coaches, and how to obtain permits, if necessary. General Information – The French Quarter/Vieux Carre District is bounded by Esplanade Avenue, North Rampart Street, Canal Street, and Decatur Street. Rules and Regulations – Buses less than 31 feet are required to use authorized routes as indicated on the map. “Out of Town” buses longer than 31 feet can enter the French Quarter using authorized routes ONLY on day of arrival and day of departure provided they acquire a permit from the hotel. Buses longer than 31 feet are not allowed to pick up or drop off in the French Quarter any other time. See designated peripheral bus loading and unloading areas on the map. 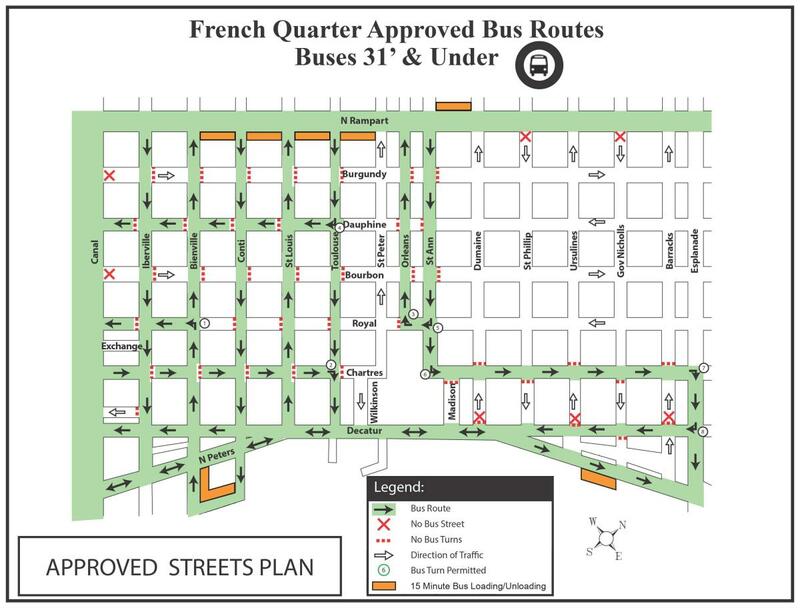 Buses can only make turns at intersections within the French Quarter as noted on the map. Buses are not permitted on routes designated “No Bus Zone.” Please refer to map. Buses must load or unload passengers in loading zones or passenger zones. They may also use freight zones if no other vehicle is waiting to enter. Loading and unloading are limited to fifteen minutes. Buses shall not idle for longer than ten minutes. Buses shall not idle for longer than ten minutes while stopped or parked. Permits and Maps – Permits are to be obtained in advance by the hotel. The permit must be displayed in the top right hand side of the front windshield. Penalties – Penalties for violation of the French Quarter/Vieux Carre bus restrictions may be imposed and can include fines. 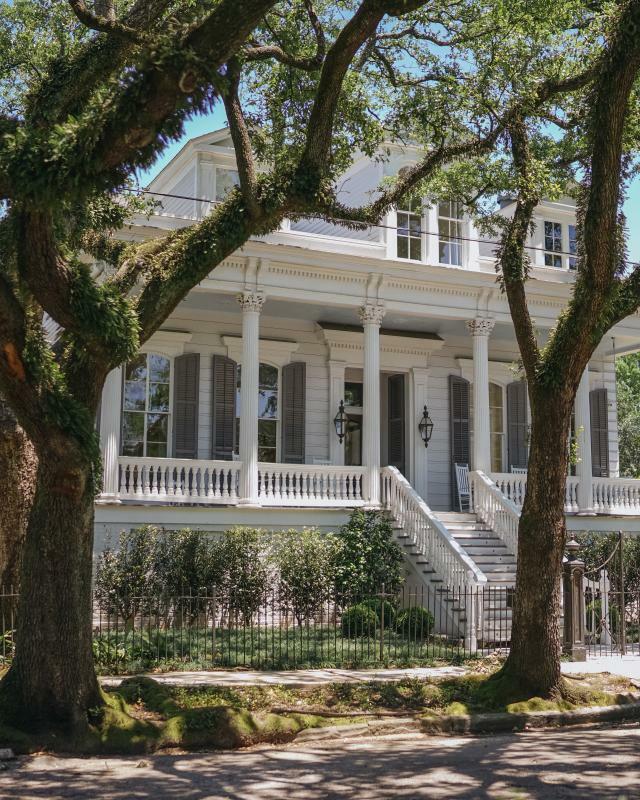 General Information – The Garden District is bounded by St. Charles Avenue, Jackson Avenue, Louisiana Avenue, and Magazine Street. Rules and Regulations – No buses with a seating capacity of more than 20 passengers may travel in the Garden District (see exception below). The Department of Safety & Permits Ground Transportation Bureau may authorize up to 22 buses per month having a capacity of more than 20 passengers to travel on Prytania Street and Washington Avenue within the Garden District for the sole purpose of receiving and discharging passengers from commercial establishments. Buses must have a permit and a copy of the bus route on board. Loading and unloading is authorized only in zones that are marked and bear signs. Tour buses may be parked while pedestrian Garden District tours are in progress at authorized zones in nonresidential areas. Buses shall not idle for longer than ten minutes while stopped or parked. Permits and Maps – To obtain a Garden District permit, contact the Department of Safety & Permits Ground Transportation Bureau at 504-658-7170. Penalties – Penalties for violation of the Garden District bus restrictions may be imposed and/or may result in suspension of future permits.